— Martin J. Sherwin, coauthor (with Kai Bird) of the Pulitzer Prize-winning biography, American Prometheus: The Triumph and Tragedy of J. Robert Oppenheimer. "Claude Shannon (1916–2001) is to computer science what Newton is to physics: the mind that revolutionized its field. . . . a warm and engaging portrait that traces Shannon from his Michigan boyhood to his standing as a modest scientific celebrity." "Soni and Goodman deftly illustrate how personality, humility, courage, and, above all, curiosity facilitated [Shannon’s] historical contributions. In addition to sympathizing with Shannon’s awestruck colleagues and starstruck graduate students, readers will come away with a feeling of having gotten to know the man personally. . . . For historians, philosophers, cryptographers, geeks, introverts, and anyone who has ever taken something apart to understand how it works." "In A Mind at Play, journalist Jimmy Soni and political theorist Rob Goodman tell Shannon's story engagingly, from the perspective of a lay reader wrestling with the sophisticated ideas that Shannon explored with dedication and panache. The book is a boon for those eager to know more about his incredibly influential life — whimsical, independent and curiosity-driven....Soni and Goodman have done their research. [A] vivid portrayal." "This is the most comprehensive biography of the man I've come across." "To read this book is to take a journey through history and understanding...Simply put, this will henceforth be one of the books I can’t shut up about when people ask for recommendations. If you enjoy anything at all about the digital age we live in, go out and get yourself a copy...You should know how these things that bring you joy, or money, or allow you to communicate easily have come into being. And for all of it, you owe a debt of gratitude to the man who is the subject of this thoroughly well-written book; Claude Shannon." "If Soni and Goodman manage to make the key ideas the centrepiece, they also succeed in maintaining interest in the man behind the theory." You know Einstein, but you should know Shannon. 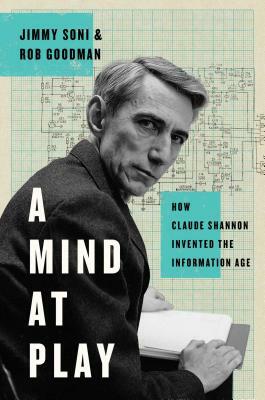 A Mind at Play, a charming account of the life of Claude Shannon, one of the 20th century's most distinguished scientists, makes that compelling case. The biography is full of entertaining bits about the thinker-tinkerer who first divined the significance of the bit (aka "binary digit," the fundamental unit of information). Readers will enjoy this portrait of a modern-day Da Vinci from his incredible early career breakthroughs to the more flippant pursuits of his later years, like juggling through the halls of Bell Labs on a unicycle, or engineering a flame-throwing trumpet.